Bach wrote all these solo violin pieces relatively early in his career, when he was court composer at Anhalt-Coethen. During this period of 1717-1723, prior to his move to Leipzig for the rest of his life, his duties involved only secular music. These are exceptional-sounding recordings of these pieces, both with respect to their sonics and the performances. The outstanding feature of these recordings, one which very possibly distinguishes it from all of the hundred and thirty seven recordings of Partita 2, not counting the many additional versions of the Chaconne listed at ArkivMusic, is their sonic ambience. 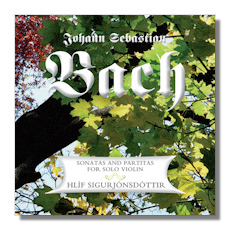 The Partitas were recorded in 2000, 2001 and 2002, and the Sonatas in October 2007 in a church north of Reykjavik. The recorded sound is such that the listener (this one anyway) feels a great sense of spaciousness, a sense that one is there in that place, something I have noticed in very few recordings. There is here a particular kind of resonance, unlike that of a wooden chamber, for instance, and certainly more noticeable than the transparent sound of a studio recording. The violin seems to have been miked at just the right distance; the sound of the instrument is full, and for acoustic reasons I do not fully understand this ambiance accentuates the subtle, but noticeable dynamic range of the playing even within phrases, and the wide range of sounds a violin can make. I suppose some listeners might find this sound edgy. I find it satisfyingly expressive. Hlíf Sigurjónsdóttir was born in Copenhagen and grew up in Reykjavik. Her musical studies brought her to Indiana, Toronto, Banff and New York City. In Iceland, where shefirst performed with an orchestra at age 11, she studied with a student of Adolf Busch andin New York she studied with Gerald Beal, whose teacher was Jascha Heifetz. She has performed widely in Europe and the U.S., including a recent concert in new York. The CDs have the three Sonatas in order of composition on one disc and the same arrangement of Partitas on the other. The titles and timings of individual movements are given but, I regret to say, the recorded bands are not numbered in the printed material, so you have to do that yourself.